Mexico 3, El Salvador 1: Second half onslaught helps El Tri eliminate La Selecta from World Cup qualification. SAN SALVADOR, El Salvador. Mexico overcame an early first half deficit to defeat El Salcador 3-1. Alexander Larin (pen., 24′) initially put La Selecta in front, but second half goals from Hector Moreno (51′), Angel Sepulveda (57′), and Raul Jimenez (74′) sealed the win for Mexico. The win keeps Mexico’s hope of a perfect penultimate round of World Cup qualifying alive, while eliminating La Selecta from World Cup qualification altogether. El Salvador needed a win at the boisterous Estadio Custlacan to have any hope of advancing. Anything less than that win, given Honduras’ win over Canada earlier in the day, would see La Selecta‘s World Cup qualification campaign end at this stage for the second cycle in its last three. La Selecta will have to wait another four years to try to qualify for its first FIFA World Cup since 1982. 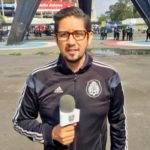 With all the injuries to key players and the hard work out of the way, El Tri opened the match by playing in a defensive posture for most of the opening phase of the game. Although El Salvador had a few crosses and shots on goal in the game’s first few minutes. La Selecta challenged El Tri hard and furious in the midfield, and bolstered by a loud Estadio Custlacan, started to force Mexico into more mistakes in the midfield during the buildup. And only after a few shots and half-chances on set pieces, the hard challenges coming from the El Salvador midfield started to have an influence in Mexico’s ability to build attacks. In the 23rd minute, a turnover in the midfield by Hector Herrera which was picked up by Pablo Punyed eventually forced a penalty, as Jorge Torres Nilo played a cross from Jaime Alas with his arm. Alexander Larin powered the penalty past the diving Guillermo Ochoa to open the scoring for La Selecta. La Selecta continued to pressure El Tri into mistakes and had a chance three minutes later on a quick counter, but the eventual shot misses. However, El Salvador would rue their missed chances as Mexico equalized in the 51st minute off of a set piece. Hector Moreno slotted Andres Guardado’s free kick past Oscar Arroyo to level the score at 1-1. After the second half started, with Jesus Duenas coming on for the ineffective Javier Aquino, the side seemed to play with much more intensity. Six minutes after Moreno equalized the score, Angel Sepulveda gave Mexico the lead. With El Salvador’s pressure broken, Hector Herrera was able to find the streaking Sepulveda from the near post on a diagonal ball. Sepulveda placed the free header past Arroyo to give El Tri the 2-1 advantage. The goal capped off a memorable debut match with El Tri for the Queretaro striker. In the 74th minute, a hard shoulder check by Roberto Dominguez on Angel Sepulveda inside the penalty area gave Mexico a penalty of its own. Raul Jimenez converted the penalty to take El Tri‘s advantage to 3-1, with Mexico’s tactical dominance at this point finally starting to show up on the scoreboard. Mexico put the game away by playing a little keepaway, but El Salvador did create one last chance before the final whistle. But Memo Ochoa collected the final shot from Nelson Bonilla to confirm the win. Mexico (5-0-0, 15 pts), will try to finish the round on a perfect note when they host Honduras on Tuesday, September 6. El Salvador (0-2-3, 2 pts) will travel to Vancouver to try to spoil Canada’s World Cup qualification. Both games will kick off simultaneously at 10:00 PM EDT (7:00 PM Pacific DST).